Parasaurolophus was quite an interesting looking dinosaur. One of the most distinctive features was undoubtedly the prominent crest on its head, which was a long curved hollow tube-like structure protruding from the nose upwards and back from the skull. Quite the fashion statement, eh? Scientist aren't quite sure what the purpose of this crest was, but it has been hypothesized that it might have been used as a communication system. They think these tubes acted as a resonating chamber to produce low frequency sounds to alert others. The dinosaur would blow through its nose and the sound would come out through the crest. Like a prehistoric telephone! Parasaurolophus means “near crested lizard” and was part of a family called Hadrosaurs, which means that is was bird-hipped and had a flat duck bill. Hadrosaurids could also walk on two or four legs. The front legs were slightly shorter and thinner than the back legs, making the back legs stronger and sturdier. Considering this, it probably used all four legs for slower activities, like hunting for food, but ran on two, for faster speed. 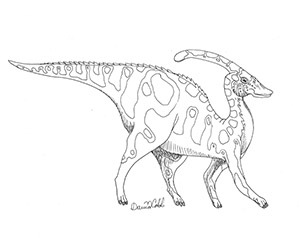 A Parasaurolophlus usually measured 31 feet long and weighted between 2-3 tons. These dinos roamed the earth during the late Cretaceous period, about 76-73 million years ago. There are actually three distinct species of Parasaurolophus, varying slightly in crest size, but mostly had similar characteristics. The names of these species were P. walkeri, P. tubicen, and the short-crested P. cyrtocristatus. Parasaurolophus was an herbivore, which means it ate plants. It chopped plant matter off with its beak, and stored the food in its cheeks, kinda like a squirrel. Pretty handy if there was ever a lack food around. Similar to Triceratops, Parasaurolophus had a complex set of teeth, that were continually being replaced. Its teeth were stored in dental cavities, containing hundreds of teeth. Only a handful of teeth were used at a time. Its like having an endless supply of teeth. Fossils of Parasuropholus have been found in widespread areas, which means they must have traveled fare and wide. The have been found in Canada, New Mexico and Utah, and even China. Parasauropholus was first described in 1922 by William Parks from a skull and partial skeleton found in Alberta, Canada. 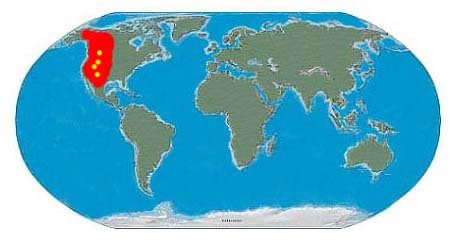 Possible Range of The Parasaurolophus. Known Fossil Sites in Yellow.